For over 34 years, Big 'O' Dodge Chrysler Jeep Ram has been serving the Greenville area as well as Easley, Greer, Anderson and Spartanburg with excellence and the best in new Dodge, Chrysler, Jeep and Ram vehicles. Our family-owned and operated dealership is dedicated to making sure that our services meet every automotive need that our customers may have and we always look forward to welcoming new customers into our Big 'O' family. Founded by Michael Odum, it is now under the leadership of Michael's wife, Beverly, and their two sons, Jake and Kyle. Their founding principle is that the customer always comes first, so no matter what you may need our dedicated team will work with you until all of your needs are satisfied. Along with exceptional customer service, we offer complimentary coffee in our TV lounge as well as free WiFi so that you are comfortable while you get your vehicle serviced. No matter if you are from Greenville, Spartanburg, Greer, Anderson or Easley, Big 'O' Dodge Chrysler Jeep Ram is here to make your car buying and servicing experience unlike any other. In order to make your car buying experience as easy as possible, you can find our entire new and used inventory online, as well as a finance application, service appointment scheduler and parts order form. 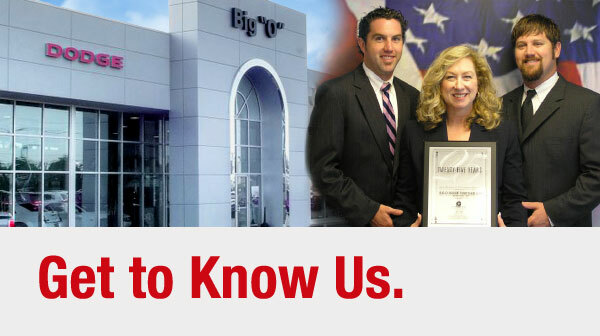 If you happen to have any questions or would like to get to know us more, please see us under the big American flag at 2645 Laurens Road, Greenville, SC 29607. We look forward to serving customers from Spartanburg, Greer, Anderson and Easley, SC.